Now that you've learned how to configure your Platform Account, you're ready to display your content. This document describes the TwineSocial Web SDK, which is the simplest and quickest way to showcase social content. Many more advanced features - such as infinite scroll, responsive view, layouts, colors, themes, and CSS are described here. More questions? Search the Knowledge Base, or ask in the Community Forums. 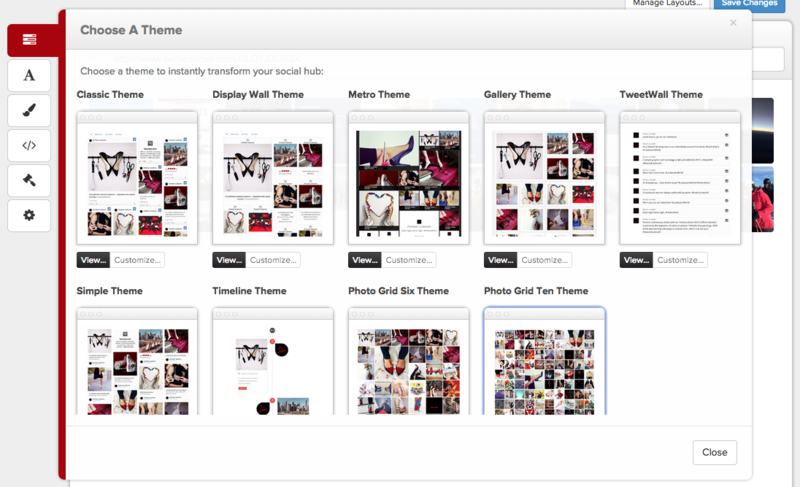 The TwineSocial Web SDK renders content based on a Layout defined in your Management Dashboard. You can optionally define multiple layouts for your campaigns; each layout can have colors, fonts, theme, locale, CSS, and other attributes associated with it. This is commonly used for brands who need to represent their campaign content differently on different web properties, or who want to embed locale-specific versions of their campaign content as needed. ...or add the theme-layout parameter to the script source. If a theme-layout is specified in your script source, it will override the theme saved with your Layout. The TwineSocial Web SDK includes an extensive library of built-in fonts. If a theme-font is specified in your script source, it will override the theme font saved with your Layout. Don't see a font you like? Use your own brand font by including it inside your CSS. The TwineSocial Web SDK allow you to completely customize the look and feel of rendered content with CSS. To do this, you'll need to upload CSS styles into your layout. Pro Tip: The TwineSocial toolbar provides a rich, real-time preview tool so you can preview your CSS changes in real-time. Access the toolbar in the lower left corner of any page hosting the TwineSocial Web SDK script. In addition, you can change the sort order of the Collection tabs, individually hide or display specific collections, and choose which Collection is shown by default when using the Web SDK. Learn more about this feature under Platform. Support for many common languages are provided. Don't see the language you need? Ask! A times you may wish to "deep link" to a collection other than the default collection within your embedded hub. To do this, simply pass in the collection ID in a ?social-collection=YOUR_COLLECTION_ID parameter on the parent page. You can include any other parameters (like GA source parameters) along with the social-collection paramater. To find the ID for a collection go to the Collections section in the TwineSocial admin. Then click the gear icon on any collection and copy the Collection ID. Additional options can be added to your script source URL. In some cases, these parameters are available as a layout parameter. If the option is included in the layout parameter AND in the script source URL, the script source URL supercedes. scroll yes yes, no Enable/disable scroll bars on the view. When omitted, the iframe will dynamically be resized to fit the height of your campaign content. This is the preferred implementation, with better support on mobile and tablets. When set to no, your Web SDK content will be in a scrollable region. Maximum number of items to retrieve per request, up to a maximum of 100.
showLoadMore no yes, no Enable/disable infinite scrolling. When set to yes, a Load More button will appear at the bottom of the view. Otherwise, when visitors scroll closer than 400px to the bottom of the document, additional content will be retrieved and appended to the view. photosOnly no yes Limit display to campaign items that contain a photo. autoload yes yes, no Auto load more when reading the bottom of the social hub (not the window). css on off, on If Custom CSS is defined in the layout, setting &css=off will suppress these CSS rules. height (numeric) Set the height of the view IFRAME in pixels. Used in combination with scroll=no to constrain the view to a scrollable region. layout Use a specific Layout ID when displaying this view. theme-color white black, white, gray Use a specific theme color when displaying this view. theme-layout classic classic, display-wall, gallery, sidebar, tweetwall, fullscreen, and others Use a specific theme color when displaying this view. Overrides any layout-specific color. theme-font open-sans open-sans, architect, courier, dosis, georgia, montserrat, poiret, raleway, times-new-roman, trebuchet, ubuntu, verdana Use a specific font when display this view. Overrides any layout-specific font. lang en en, fr, it, fr, sv, de, es Use a specific locale/language for the UI components (Facebook sharing, Twitter intents, etc.). Overrides any layout-specific language. showNav no yes, no Display a navigation element at the top of your view, corresponding to visible Collections. collection (numeric) Display content from a specific Collection ID. debug off on, off Display diagnostic and troubleshooting options in the console window, and throughout the view UI. extra-class Add a CSS class name to the body of the view. Enable/disable display for CTAs and shoptification links on an embed. A WordPress Plugin for TwineSocial is maintained. 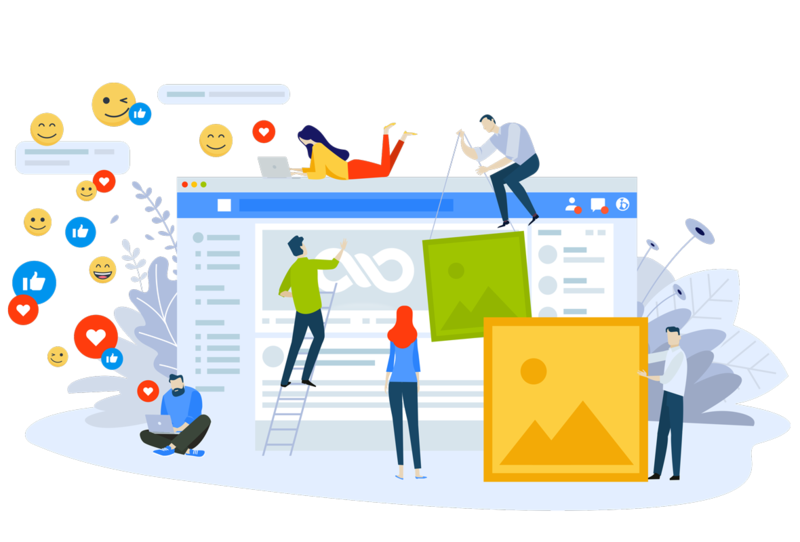 While the plugin does not offer any additional functionality that cannot be accessed directly with the Web SDK, it may be more convenient for some users. The plugin generates a shortcode for use in a Page or Blog Post, as well as support for Wordpress Widgets. Learn more about the TwineSocial Wordpress Plugin. HDMI Most laptops offer an HDMI output. Simply embed your layout on a web page, and connect the HDMI output of your laptop to your display device. You can access analytics for actions taken on your hubs (such as detail views, shares, and page loads) with Google Analytics or TwineSocial's native analytics. If you need to write analytics to your custom analytics warehouse or to a third-party analytics provider, we recommend you use the onEvent() method. page_load: A TwineSocial page is loaded. load_more: A user scrolls the page (or clicks the "Load More" button) to load additional posts. view_post: A user clicks the detail modal on a post. share_post: A user shares a post on Facebook from within your hub. tweet_post: A user shares a post on Twitter from within your hub. retweet_post: A user retweets a post on Twitter from within your hub. reply_to_post: A user replies to a post on Twitter from within your hub. favorite_post: A user favorites a post on Twitter from within your hub. pin_post: A user pins a post on Pinterest from within the detail modal. The name of the TwineSocial campaign on which the action took place. The total number of new posts loaded. Only present on page_load and load_more actions. Specifies the host network of the post being viewed, shared, tweeted, or pinned. Not present on page_load and load_more actions. The native URL of the post being viewed, shared, tweeted, or pinned, if available. Not present on page_load and load_more actions. The username of the author of the post being viewed, shared, Tweeted, or pinned, if available. Not present on page_load and load_more actions.